Healthy Habits promotes confidence and well-being for Boys & Girls Club youth aged 6-18. Designed to incorporate healthy living and active learning in every part of the Club Experience, Healthy Habits emphasizes good nutrition, regular physical activity and improving overall well-being. The program, for ages 6 to 18, is the Mind component of Triple Play: A Game Plan for the Mind, Body and Soul. 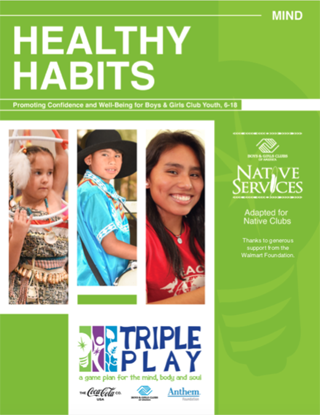 BGCA’s Native Services Unit has reviewed the Healthy Habits curriculum to provide Native Clubs with an adaptation of the curriculum that is more reflective of Native culture.